Steve: Welcome to all our, Becoming Your Best Podcast listeners, wherever you might be in the world today! This is your host, Steve Shallenberger. I am so excited for the guest that we have on our show today. She’s helping people across the world to live a simpler, more balanced life… Welcome Courtney Carver! Courtney: Hi, Steve. Thank you. Steve: This is gonna be fun folks. I’d like to give a little introduction before we jump right into this interview. Our listeners know about Becoming Your Best. That The 12 Principles of Highly Successful Leaders is built on 40 years of research of leaders that have sustained excellence. What I found in that research, I interviewed hundreds of people, that they weren’t perfect. But they were among the very best of what they did across the world. The one thing I did observe is that there were 12 Principles of Leadership always present. These are things that we can learn like playing a sport or baseball, as we practice we can get better. Part of those, have to do with creating excellence and leadership of teams, organizations, or one life. Another part has to do with creating outstanding relationships. How do we create a culture that creates excellence? Well, the last part has to do with becoming your best type living. And they set their part, their selves apart from others. Well, that is where Courtney Carver comes in. That’s why I’m so excited to have her, as one of those principles. I’ve seen over and over and over again, that highly successful leaders figure out how to live in peace and balance. That they could sustain their performance over a long period of time. They can enjoy the journey. It’s going to be interesting because Courtney has some great ideas about this. For our listeners, did you know that over half of Americans are living beyond their means? That 78% live paycheck to paycheck. 90% buy things they can’t afford. So to what end, we’ve all heard the old adage that you can’t buy happiness. So why do we have or feel we need so much stuff? Courtney has a wonderful book coming up called “Soulful Simplicity: How Living with Less Can Lead to So Much More.” So I can’t wait about this. We’re gonna talk about it on the show today, Courtney. I guess is it coming out a little later this year? Courtney: It is. December 26th is the publication date. Steve: Okay. Well, that will be fun. I’m excited to get that. Courtney is the creator of bemorewithless.com and something called the Project 333. It’s a challenge and we’ll have the chance to talk about that. But it shows us how to pare down not only our closets but our mental and emotional spaces. She has all kinds of tips, of how to live life better. 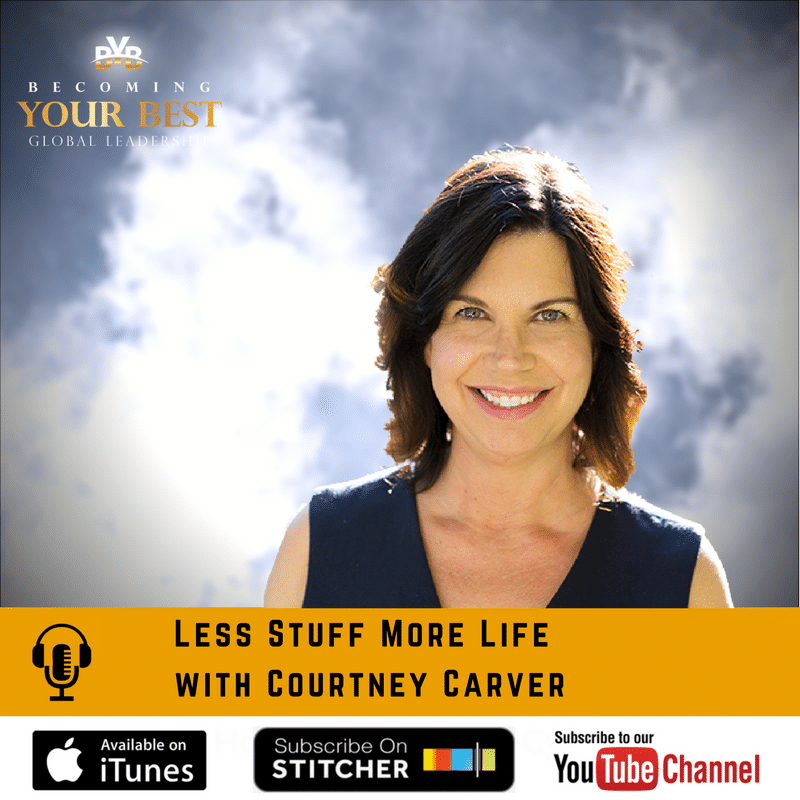 It’s interesting because Courtney outlines how to cut out the clutter, dig out of the debt, and make the space and time for ourselves and loved ones. It’s interesting also, Courtney has a personal story to talk about. I hope that she’ll bring this up that has to do with MS and the factors that contributed to it. With that brief background… Before we get started I’d like to have Courtney tell us a little about herself. Especially, what was your life like growing up? What experiences helped you to see that you could be successful? We’d love to hear about this perspective. Courtney: Wow, well, that could take a long time. Going way back but I’ll try to keep that short and that I had a great childhood. I grew up on the East Coast, with my mom, dad, and sister. I think watching my dad start his own business at a pretty young age. Me being at a pretty young age, inspired me or sparks that entrepreneurial spirit. It didn’t come up until much later but I knew when I began to start my own business that that was what gave me the okay to deal with a little bit of uncertainty. We did a lot of fun things growing up. Traveling, and did some hiking in New England, and everything seemed pretty normal to me. I know that’s a hard word to bring up but that’s how it felt growing up. As soon as I got out on my own and started school, I immediately went into debt. When you were talking earlier about those statistics about half of all Americans living beyond their means. For a certain percentage, buying things that they can’t afford, that I fell into those statistics. Once I got so deep into debt it seems like every decision I made after that was in response to the debt. I have to make more money to pay the debt, I have to work harder. It was always, at least, it felt like it always about the money, how am I gonna make ends meet. Steve: Well, it definitely is the elephant in the room. Isn’t it? Courtney: It sure is. It sure is. I mean living beyond our means. I think it’s more than half. I can’t remember what you said, but I think you said half of all Americans, and I think it’s more than that. We get so comfortable once we’ve extended ourselves. Or at least for me, once I had gone past the point of having hundreds of dollars of debt. I had thousands of dollars, I thought, oh, well. Nothing terrible is happening to me, so I may as well just keep going. Keep making ends meet, keep overspending, because I’m working so hard, so I deserve nice things. It was this vicious circle that I am so glad I finally broke free off. Steve: Wow. So how did you break free of it? Courtney: What we did in terms of our debt is we followed the Dave Ramsey Plan. And for anyone who doesn’t know, Dave Ramsey is a radio host, author, and of a financial expert/guru. I don’t like that term but if I had to use it, it would be for someone like him. Who teaches you how to not only pay off debt but live within your means and in a very practical way. So it’s not like a get rich quick, it didn’t feel schemey or scammy to me. And the thing that I like the best about it is that it wasn’t about the math and like gaming the system. It was about practical ideas. And I needed that because if you had made it all about the numbers I would have been lost. I’m not strong in math or numbers, by the way, my bank balance used to be. So it was nice to have an easy to approach plan. To be hearing stories of lots of other people who had gone through a similar path and hear their success stories. That’s always very motivational to me because if they can do it I can do it. Steve: Well, that’s a great story, congratulations. And Dave Ramsey is amazing. He’s inspired so many people and just the philosophy, the common sense philosophy of how to not spend more than you make. And it sounds like you’ve applied some of those principles in other areas of life? Courtney: I definitely have, in fact, that wasn’t the first place I simplified my life. I started by simplifying my diet. I’ll back up for a minute and share why I decided to do all this. Because I didn’t wake up one morning and think, “Oh, things have got to change.” I wish I had been that enlightened but I needed a strong wake-up call to change my ways, and I got it. Steve: I’m just gonna say something here. Steve: You cut off for a second and it cut out that you had been diagnosed with multiple sclerosis, is that right? Courtney: I was. In 2006, I’ve got that diagnosis. And it was my big wakeup call because I had felt bad before. I had felt rundown, stressed out, exhausted, but I just thought I’m busy. I’m a hardworking person. I need to keep going, keep going, keep going. I ignored my body telling me it was time to slow down a little bit and take care of things. And so with the MS diagnosis, I did take the message very clearly and decided to slow down. And started looking at all the stress in my life and how I could eliminate as much of it as possible. And so I looked at my diet and made some changes there. I eliminated the stuff and clutter in our home that was always seeming to be a reminder of my debt and discontent. I was buying things because I thought it made me happy, when in fact, that happiness was very short-lived. As soon as the credit card bill would roll-in I wasn’t so happy anymore. Courtney: Then we started looking, as a family at our debt. Even our home, the size of our home, my work, everything changed over the course of several years. It wasn’t an overnight transformation and that was very intentional. Prior to that, any changes I made in my life had to be all or nothing, fast and furious, and they never stuck. So I thought, this time they’re gonna be slow and steady. One at a time, get used to the new normal and then make another change. Steve: So was the MS the catalyst that caused you to step back and just really rethink life and the direction you wanted to take? Courtney: It definitely was. And when that happened, I didn’t know or even intend to make all of these changes but I knew that I wanted to live well with MS. That was my primary focus. I wanted to find out how I could be healthy with MS. And my research all pointed to reducing or eliminating stress. So for my own sake and for my family, for my husband, and my daughter I wanted to be the best version of myself that I could be. And I wasn’t sure what that was gonna look like after the MS diagnosis, so some changes had to be made. Steve: Well, that’s amazing! First of all, congratulations for figuring out how to try to get your life back on track. How to adapt and do some wonderful things in the process that are blessing other people. Courtney: It’s been an incredible journey for me to be able to do work that I enjoy. Hold on I’m just gonna let these sirens pass by. Courtney: Yeah, good timing. I think it’s just because I live in the city but we could take it as a sign. Steve: Yeah, it’s a sign like how can people have a wakeup call in their lives? How can they pause and take stock. This is what Becoming Your Best is all about. It’s not about trying to be Courtney’s best or somebody else’s best, it’s your best. Sometimes we get caught in this circle. This vicious circle you’re talking about. We don’t step back and assess and say, “What are the things I need to do to get to a better place, to be happy, or to be more productive. To be sure I’m doing things that where I can make a difference.” So what’s been in your thoughts as you’ve reflected on that Courtney of, how can somebody do that? How do they have this wakeup? How can they have a wake up in life and get on track? Courtney: Yeah, I’ve thought about this quite a bit because the MS wakeup call was not my first wakeup call but it was the first one I answered. What happens is that we get so caught up in keeping up and trying to hold it all together. We don’t think we have time to answer our wakeup calls. And so our wakeup calls don’t have to be this big devastating diagnosis. It could be something that our child says to us. Or it could be this feeling that we have inside, or it could be a chronic headache that we can’t seem to shake, lack of sleep. There are so many things that we experience them on a day to day basis. I mean, I still am delivered wakeup calls especially if I’m veering off course. Working too much, things like that. But because I’ve decided to pay attention and to answer those calls I hear them loud and clear now. What we have to do is, even if we don’t think we’ve had a wakeup call, or we’ve dismissed other wakeup calls. We just stop to pay attention to them. So, pay attention to what’s going on not just on the outside but on the inside. So that we may answer the calls. Steve: Okay. Well, that’s a great advice. Certainly, as we move along that’s one of the things that can help us to get to a better place. Just to listen, to be attentive to our feelings and not brush things off and make it a way of life. So let’s get right into simplifying. How do we simplify? Give us some examples of ways that you’ve done it that you teach others of how to do it and what’s the impact. And I’d love to have our listeners hear about Project 333. I read about it on your blog. And so go for it. Courtney: All right, well, let’s start with Project 333 because I mean simplicity as you can imagine is a pretty big umbrella. It can cover a lot of different things. And, while I don’t think it really matters where you start. I know one powerful place that you can start is in your closet. And for me, I started Project 333 which is a minimalist fashion challenge in 2010. So seven years ago because even though I was simplifying my life I wasn’t simplifying my closet because it was out of control, to be honest. It was just chaotic. I had so many things in there and I just kept adding. It seems like the one place where I was always shopping, always adding, and never subtracting. I thought my slow and steady approach to change is not going to work for this particular part of my life. I created a challenge and I made some rules and wrote about it on my blog. The rules were and still are, they haven’t changed from the very beginning. You pick 33 items. Including clothes, accessories, jewelry, and shoes, and those are your items that you’re going to wear for three months. And so you take everything else and box it up and hide it. You don’t give it away, right away, because you don’t want that fear of, “Oh, my, gosh, what if this was a huge mistake.” Instead, you get it out of sight. See what it’s like to live with your 33 items and see what it’s like to have more on space and a sense of calm instead of chaos. It’s amazing how contagious that level of simplicity becomes! After you see that, the challenge isn’t really that challenging. Courtney: Yeah, I think I probably had that in shoes, so the shoes were a struggle for me in the beginning. For sure, I thought how am I gonna pare down to? I think my first time I had four pairs of shoes for the three months and I thought this was never gonna work, but sure enough, it did. Courtney: Here’s the funny thing, it wasn’t hard. The hard part was thinking about it. Thinking about what might happen, worried that people might notice. All those fears come up in the form of excuses. But once we start and took action. The fear dissipates and we realized that the hard part was the thinking about it, not the doing it. Steve: Okay, so you start enjoying the fact that your life is simpler and like you said, there’s a greater sense of peace. Courtney: There’s a greater sense of peace, for sure. You spend less time in the morning deciding what to wear. You reduce decision fatigue because you’re not trying to choose between all your clothes. You only have a small selection of your favorite things. Courtney: Yeah, it’s pretty interesting. Steve: So you’re feeling good about what you’re wearing too? Courtney: You do, that part is a work in progress. You might find out after three months that you need to…there was something in there that you really didn’t enjoy or that didn’t work. But with only 33 items you get very clear on what is or isn’t working. Whereas, with our traditional, just stick it in the back of the closet, we never really know what we enjoy wearing. Steve: Well, I love this idea and I’m excited, I’m inspired to, I don’t know about the 33 items but I can cut way, way back. So I want to thank you for the idea alone. Courtney: Sure. And remember it’s only three months. So if 33 seems too challenging or completely impossible there’s nothing wrong with picking a different number like maybe your number is 55 or 42. The magic isn’t in the number. It’s setting those parameters and sticking with it to see what happens. Steve: So once you had experienced with this. You started getting confidence and felt the result, the impact. It was bringing greater peace and happiness and balance… Were you able to take this and apply it to other areas of life? Courtney: I was. Like I mentioned, I had been already simplifying my life. Getting rid of some clutter in the house but this really inspired me to go the distance. To go back into those spaces like my kitchen and ask questions. Do I really need 10 wooden spoons? Do I need all of these wire whisks? Do I need two sets of measuring cups? Things that we accumulate almost by default that we never question. Those things build up and turn into clutter. So we were able to downsize and get rid of probably close to 90% of our stuff. We had empty rooms in our house by the time we were all done with it and finally decided to sell our house and downsize into a small apartment. Steve: Wow, wow, that is transformational, isn’t it? Courtney: It sure is. I mean the freedom and I guess lightness that comes with that has been extraordinary. And I’m not saying it’s for everyone but it’s definitely worked for us. Steve: And you were getting out of debt as well, so. Courtney: Correct, and not only getting out of debt but realizing… That time I spent trying to make ends meet, all I needed to do is have fewer ends. Not be spending as much, not have as many credit cards, not overextending in every possible way. I can imagine if I ever done a tally, over the past seven years, being so mindful especially about my closet. I can imagine the amount of money that I’ve saved. Steve: Oh, yeah, that’s amazing. What’s your experience been Courtney, in terms of, you really have to have a spouse or a partner that’s onboard with this? So how do you bring the subject up with them and help them get onboard so that they can share this vision? What’s been your experience there? Courtney: My experience has been that you can’t really get other people onboard. Rob Bell, who is an author and pastor, and podcaster, and speaker, he has a great saying that I just love. He says, “You can’t bring people where they don’t want to go.” And I have found that to be true. Looking at all types of different scenarios. Thinking about change in my own life. If somebody suggests the change to me, I’ll consider it but I have to be ready for it. I have to be inspired and motivated and ready to go. I’m not gonna do it whole-heartedly because somebody else mentioned it. That’s the same with this. Instead of trying to convince people. Instead of trying to get people onboard. Walk the walk, inspire, by your own actions and demonstrate the benefits. Talk about the benefits instead of the chores for instance. An example would be if you want to declutter your home and less stuff to experience more peace and freedom. Talking to your spouse about spending the whole week [inaudible 00:25:06] is not very inspiring. Talking about how, what donation centers to go to and how we’re gonna do this, talking about the how’s, that’s not inspiring. Talking about the why is more inspiring. Talking about why this might be good for the family. Or for a relationship, or what will happen on the other side of this. Talking about and entertaining the ideas that could come from this like if we were debt-free, how would we live differently. Having those kinds of gentle conversations I think is so much powerful than the nagging and the pushing and the convincing. Steve: Okay, that’s a great response. And in addition, just quietly going to, work yourself on positive, good things. Courtney: 100%, you have to start with yourself. You have to start with yourself. It’s the only way. A, that you can be enthusiastic about what you’d like everyone else to be inspired for. And, B, because I think people believe in your actions more than your words. Steve: Yeah, and they’ll see the result, the impact. Steve: Yeah, okay, exactly. Now, are you still there, Courtney? Steve: Okay. Just cut off for a second. All right, you’re back, so go ahead. Courtney: I was just gonna say in case, that it got cut off, I just think that the way you treat people is very inspiring as well. So if you are living with less and feeling more peaceful, chances are, you’re gonna be nicer, to everyone around you. Steve: Okay, absolutely. Well, I am always amazed at how quickly time goes and we’re at the end of our podcast. Courtney: Wow that did go fast. Steve: I mean to tell you. So before we sign off here and wrap up our program today, any final advice for our listeners? This has been great. Courtney: Thank you. I think my best advice would be to start small. It’s so much easier to approach change when you approach it in little bits rather than trying to take on the world. So just start small with one little thing and let that one little change inspire the next change. Steve: Okay, good advice. Now, how can our listeners learn more about what you’re doing and when the book comes out how can they get it? Courtney: The best way to stay in touch is my website bemorewithless.com. The book will be available there as well, and it’s available now on all major booksellers. So they could search Soulful Simplicity and it should come right up. Steve: Okay, well, that’s great. As our listeners think about this principle of How to Live in Peace and Balance, we’ve had some great ideas that can have a big impact on that today. Thank you, Courtney Carver, for being part of this show today. Courtney: I appreciate the opportunity. Thank you. Steve: Well, you’re doing a great job in touching a lot of lives. And we wish you all the best as you’re making a difference in the world, good going. Steve: Okay. To all our listeners, never forget that you too, make a difference every single day in your life! As we’ve been talking about here today, as you just quietly live these principles you can feel this enormous impact in your life. As you are becoming better, as you’re more capable in certain areas and you can feel this light growing within you that causes you to have greater happiness and peace. So it’s been fun talking with Courtney about this today. We thank all of you, for listening and joining us. This is Steve Shallenberger with Becoming Your Best Global Leadership, wishing you a great day!